The chimney crown is the cement structure on top of the chimney. The bricks go up around the tile flue liners, but at the top you need something to stop the rain and snow from falling in around the tiles. You can see that the very purpose of the chimney crown is to keep rain out. Cracks in the chimney crown can occur from shifting of the structure or from shrinkage dating back to the first day the crown was put on. When your crown has cracks, the water goes right through those cracks. How to fix a cracked crown depends upon how bad the damage is. Most crowns have small cracks. Even small ones need to be fixed because all big cracks started out as small ones. Water freezes and thaws in the cracks all winter long, year after year, forcing small cracks to eventually become big cracks. There are excellent crown coating materials such as Chimney Saver Crown Coat which cover the masonry and prevent small cracks from becoming a real problem. Once chimney crown damage is significant, though, the only fix it is to remove and relay the masonry. You can’t put a band aid on a gushing wound and you can’t coat a structurally ruined chimney crown and expect it to work. One crack in your chimney crown can lead to water entering the interior of the chimney, which leads to brick and mortar breakdown. We will remove your existing chimney cap and construct a new, 4" concrete chimney cap with bond break, Durawall and drip edge. 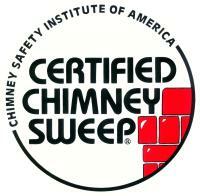 The chimney wash is the top element of a masonry chimney. 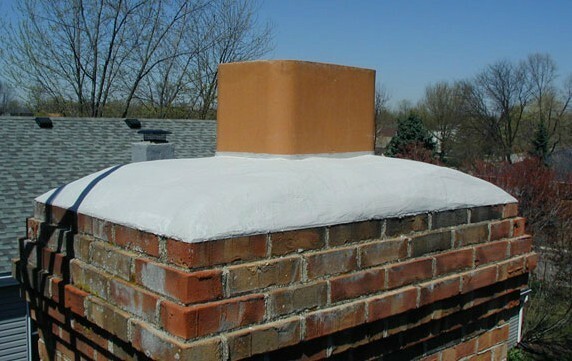 It covers and seals the top of the chimney from the flue liner to the chimney edge. The wash should provide a downward slope that will direct the water from the flue to the edge of the wash. 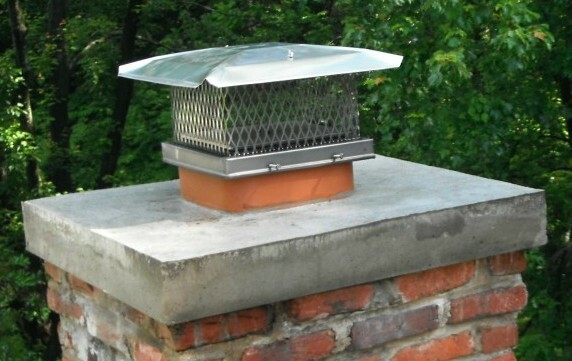 The overhanging drip edge, by directing the run-off from the wash away from the chimney, helps prevent erosion of the brick and mortar in the chimney’s vertical surfaces. Most masonry chimneys are built with an inadequate wash constructed from common mortar mix that is designed for years of weather abuse without cracking, chipping or deteriorating. A proper chimney wash should be constructed of a Portland cement-based mixture and cast or formed so it provides an overhang projecting beyond all sides of the chimney by a minimum of two inches. The flue liner tile should also project above the wash a minimum of two inches.